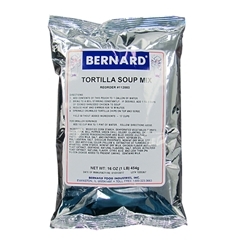 Bernard Gluten Free Tortilla Soup Mix combines all of the things you like the best in Mexican cooking. This rich, full bodied, fully seasoned soup contains low moisture tomato, onion, corn, bell peppers, green chili, celery and cilantro as well as cheddar and bleu cheese. It is virtually a meal in a bowl that can be served as a meatless product or shredded chicken can be added if desired. This is a high quality soup for school, foodservice and college ala carte line sales to students and faculty as well as for restaurants catering businesses and industry cafeteria. 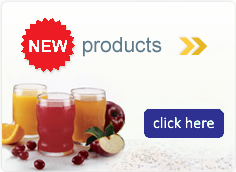 Ingredients: modified corn starch, dehydrated vegetables (tomato, onion, corn, bell pepper, grenn chili, celery, cilantro), cheddar and blue cheese powder (cheddar and blue cheese cultured pasteurized milk, salt and enzymes, whey), soybean oil, maltodextrin, salt, disodium phosphate, nonfat dry milk, citric acid and cartificial color, Yellow #6, extractive of turmeric and annatto, corn starch, nonfat dry milk, chicken flavor, autolyzed yeast extract, dextrose, natural flavors, salt, spices, autolyzed yeast extract, natural flavor, citric acid and less than 2% silicon dioxide added to prevent caking.